Making sales is part of running your day-to-day business – it’s what brings in revenue and keeps the business moving forward. We all hope that customers come to us ready to buy, but in reality, there’s a lot more to it than that. 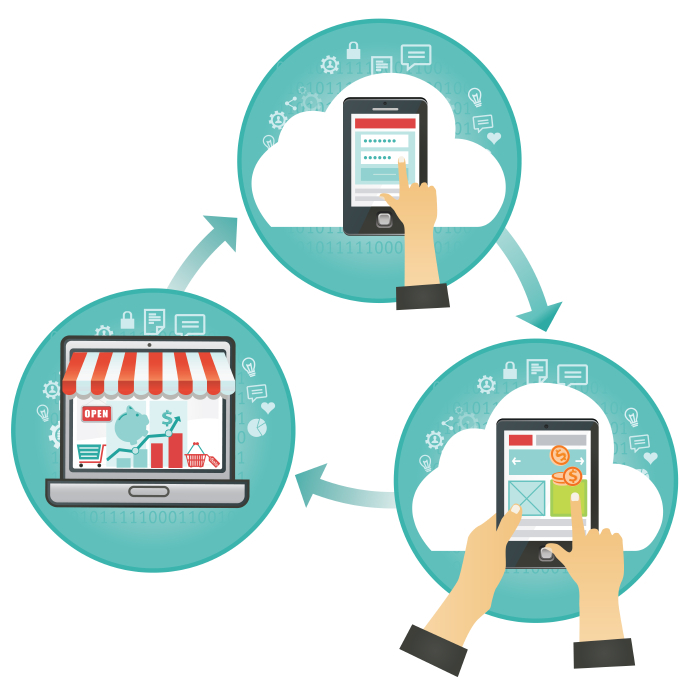 The traditional buying cycle is broken down into three segments that your customers move through in the process of making a purchase. By understanding your business’ buying cycle, you can take the right steps and make the most of it. The first step in the buying cycle is when potential customers discover that they have a need for your product. They’re not ready to buy, but they are aware of their need and your potential to fill that need. You can find these potential customers through marketing efforts and by increasing awareness of your brand. Introduce yourself. Capture their attention without pushing for a sale. The use of email newsletters, blogs, and direct mail alerts about upcoming sales are examples of the soft, but necessary, approach during this fragile part of the buying cycle. During this second phase of the buying process, your potential customers are seeking information. They’re considering a purchase and want to be educated about your company and your products. The availability of information is critical in this stage. Prospects are likely to read customer reviews, visit your website for product descriptions and make comparisons of their options. Their sense of urgency has elevated beyond curiosity, and this stage is often triggered by an event that sparks an increased interest. For example, they may have run out of an item or have an upcoming project where use of your product could make or break their success. Identify the various triggers that prompt people to buy your products and make it known that you can provide solutions to these problems. Build website and newsletter content around these issues. Make testimonials from previous customers available and accessible for those in the second step of the buying cycle. Quench their thirst for information, and continue to build their trust. When someone is ready to buy, you need to be ready to sell. Customers want attention in this third and final phase. If they already have a contact for your company, it’s important that this person is available or that your customer can somehow initiate the sale right away. Providing around-the-clock automated ordering or live support is another option to help your customers make their purchases when they’re ready. Information about forms of payment and how to contact your company should be visible on all of your marketing materials and on your website to capture the lead and close the sale. Identifying and understanding how your customers fit into the buying cycle can help your business gain qualified leads and increase your sales. So take a look at your business – what can you do to improve your customers experience in each of these stages? The proper planning and implementation here can be a huge step forward for any business. Asset-based lending and staffing agencies make good business partners. It’s something that we’ve known at Crestmark for quite some time. The Commercial Finance Association’s “The Secured Lender” magazine recently featured Crestmark’s West Division President, Pat Haney, and East Division President, Steve Tomasello, in an in-depth look at how and why staffing agencies and asset-based lending companies are a good fit for each other. 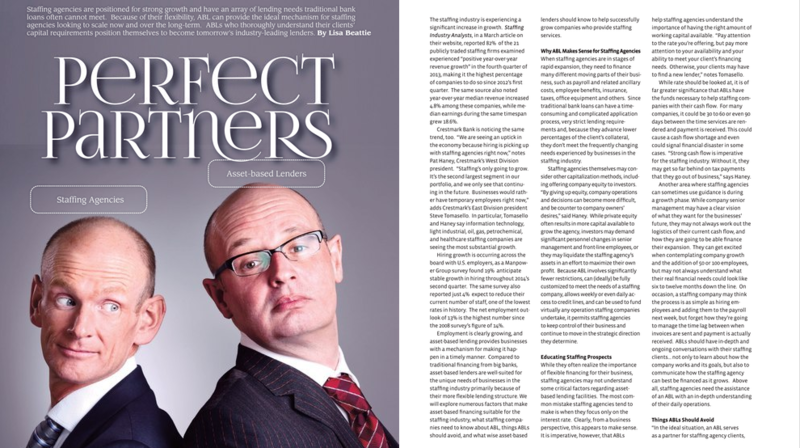 In short, the article “Perfect Partners” explains how asset-based lending companies like Crestmark are able to understand, work with and scale to the long-term needs of clients like staffing agencies that are in a position to grow quickly. While their financial outlooks are promising, staffing agencies have needs that can’t be met by traditional lenders and standard bank loans. “Staffing’s only going to grow. It’s the second-largest segment in our portfolio, and we only see that continuing in the future,” Tomasello explained in the article. In select industries, companies are hiring workers, but only on a temporary basis at the moment. That means they need the flexibility of staffing agencies that can handle the recruiting and screening process until this growth becomes more permanent. Staffing agencies don’t always meet the requirements of traditional lenders, making asset-based lenders ideal partners for meeting the rapidly rising costs of financing payroll, insurance, taxes and other related expenses. Both the staffing agency and the lender need to understand how the other company works, especially when it comes to the lag time between when the employee is paid by the agency and when the agency is paid by its client company. As with all successful relationships, communication, patience and flexibility are key factors in making the partnership beneficial to both the lender and the borrower. Want to see the full article in “The Secured Lender” magazine? Read “Perfect Partners” here. Back in the day, people walked into their banks and stood in long lines to deposit checks or make withdrawals. With the birth of automated tellers, direct deposit and online banking, consumers have slowly withdrawn from face-to-face visits. 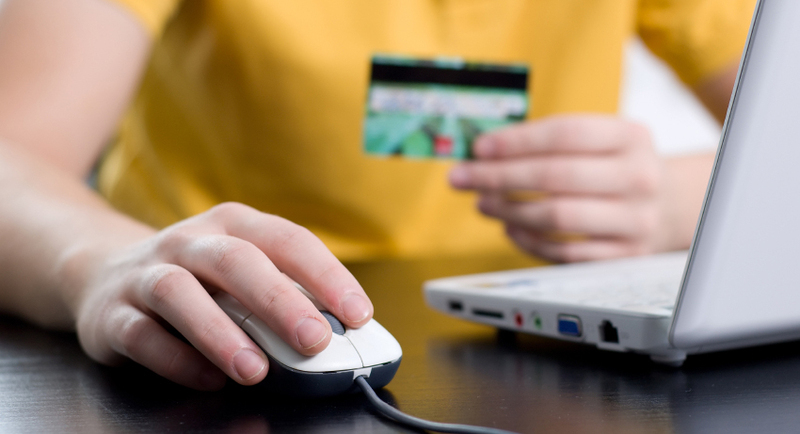 Online banking is changing the industry and the role of bank branches has changed with it. While online mobile connections make simple transactions more accessible and efficient, there is still a need for the local bank branch. A recent survey from Bankrate.com reveals that 30 percent of Americans haven’t visited a bank branch within the past six months. When they do go, the purpose of their visits is no longer to make a simple deposit or withdrawal – they want consultation and personalized attention. The Bankrate.com survey also found that the age of the consumer has an impact on how they do their banking. For example, 52 percent of banking customers age 50 and older have visited a bank branch within the past 30 days. Only 42 percent of consumers age 30 and younger have made their way to a bank branch in the last 30 days. Older Americans are traditionally slower to adopt new technology, such as online and mobile banking, but as time passes, they have learned to embrace it. According to a study by Digital Insight, 36 percent of seniors and 60 percent of Baby Boomers were actively using digital banking in 2011, as compared to 40 percent and 64 percent respectively in 2013. That number is predicted to increase to 55 percent of seniors and 70 percent of Baby Boomers by 2016. Fewer customers visit bank branches to handle routine transactions that can now be done on their mobile devices and desktop computers. As a result, the size and layout of bank branch locations is beginning to change. They’re smaller, and the teller line is no longer the central focus. The emergence of automated kiosks for express services and financial loan officers with tablets who can cater to customers anywhere in the room is a direct impact of technology. While mobile and web technology are expected to continue eclipsing brick-and-mortar branches in the future, don’t count out the branches completely just yet. People may have taken day-to-day transactions into their own hands, but consultation for financing and resolution of account problems have come to the forefront of face-to-face banking needs, and the value of real human interaction there isn’t likely to diminish anytime soon. March may be over, but the madness is in full swing as the NCAA tournament comes down to the Final Four. With barely a week to go in this annual fascination with college basketball, companies large and small are feeling the financial effects – some good, some not so much. Whether they’re plagued by employees losing productivity or bolstered by a sudden influx of tournament-hungry patrons, the impact is undeniable. According to a recent report from outplacement and career transitioning company Challenger, Gray and Christmas, more than 50 million American workers are participating in office pools. While the annual practice may have cost companies approximately $1.2 billion in lost production time in the first week of the basketball tournament alone, the firm has cautioned corporate executives to avoid taking a hard line against bracket pools, friendly discussions at the water cooler and those taking time out for updates. A blow to employee morale and loss of camaraderie could be even more costly to a company’s bottom line in the long run. While the setback to productivity has declined as the basketball games have transitioned to evening and weekend play, the excitement of bracket busters and newly formed kinships at the office continues. Companies that allow employees to wear their favorite teams’ colors or check office pool updates on the clock can still reap the benefits of enthusiastic workers. 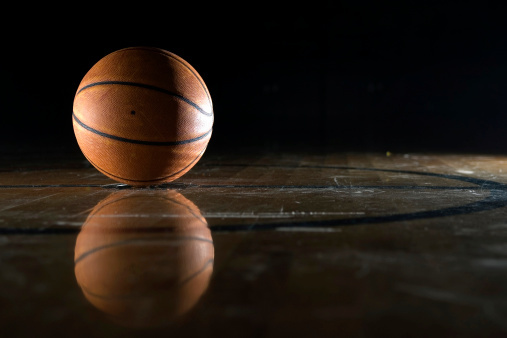 A pre-tournament survey by staffing services firm OfficeTeam found that 32 percent of the 300 senior managers surveyed believed that support of March Madness activities had a positive impact on worker morale, compared to just 20 percent in 2013. On the other side of the financial fence, many merchants have seen a rise in business during the NCAA tournament. Hotels, restaurants and shops in host cities have experienced a surge in bookings, as have providers for air and ground transportation. Mid-West bracket host city Indianapolis, for example, expected a $20 million spending impact from this past weekend’s showdowns between the University of Kentucky and University of Louisville, as well as the University of Tennessee and University of Michigan. Kentucky eked out a win against Michigan amid an economic boost for Indianapolis merchants. Meanwhile, restaurants and sports bars throughout the country offering televised games with food and drink specials are drawing record crowds of their own. In some cases, employees for these businesses are picking up extra shifts and working longer hours to meet the demand. With the semi-final games set for Friday, April 4 and the championship on Sunday, April 6, 2014, the eyes of millions of Americans are on the Florida Gators, Connecticut Huskies, Wisconsin Badgers and the Kentucky Wildcats. While there’s no doubt that the economic impact of the NCAA tournament has created both winners and losers, only three games remain until it’s back to business as usual. BLOOMFIELD HILLS, MI – TIP Capital, a leading equipment financing and asset management company headquartered in Bloomfield Hills, Michigan, was recently ranked as the 12th largest private independent leasing company in the United States for 2013 in terms of new business volume by the Monitor, the leading independent trade publication in the equipment finance and leasing industry. In 2013, TIP Capital generated $147 million in equipment lease financings to rank first out of all independent leasing companies headquartered in the state of Michigan. TIP Capital’s lease volume increased 42% year-over-year from 2012. Crestmark Equipment Finance Selects ASPIRE™ From LEASETEAM, Inc.
OMAHA, NE March 10, 2014 — LeaseTeam, Inc., the premier solution provider in the equipment and finance marketplace, is pleased to announce Crestmark Equipment Finance has selected LeaseTeam’s single system end-to-end lease and loan management solution. Crestmark Equipment Finance services two business channels: middle market, asset-based high technology and small ticket vendor-driven business. To support these two separate business models and continued growth, they needed a solution that offered tremendous flexibility from a partner with expertise in both business models. According to Jeffrey Emrich, Chief Information Officer for Crestmark Equipment Finance, “Our niche is to provide a customizable experience for our customers. To do this we needed a platform that could easily handle different types of transactions. It was essential to select a platform that was flexible enough to handle both our asset-based company as well as our small ticket vendor business, as each business channel has very different work flows. Last week, Grosse Pointe Public Schools in Michigan saw voters defeat a $50 million proposed technology bond issue to replace/add generators, upgrade phone systems, add new security cameras and doors, and install a private fiber-optic network. According to an article in the Detroit Free Press, the proposal was defeated 8,617-3,718 (unofficial results). The 10-year measure would have raised taxes for school purposes by 23%, adding 2.28 mills in the first year and costing the owner of a home with a taxable value of $100,000 an additional $228 a year. In response to the Grosse Pointe Schools’ defeat, The Detroit News published an editorial on how leasing technology equipment could provide a sustainable answer to the district’s needed upgrades. With the rapid pace of today’s IT, security, energy-efficiency and technology equipment, leasing has become commonplace with many of today’s forward-thinking businesses – although historically school districts have not pursued leasing as an option, according to the article. Crestmark Equipment Finance has partnered with many technology-based equipment manufacturers and vendors in the IT and security channels to offer municipal equipment leasing programs successfully within neighboring states. These districts and qualified municipalities see the value of leasing and the use of the equipment to stay ahead of the technology curve without risk of technology obsolescence through a direct cash purchase (or bond proposal). With technology leasing, the school district selects the equipment vendors, the lease term (months), invoicing terms (monthly, quarterly, annually) and the end of lease buyout or renewal. Crestmark Equipment Finance works with their selected equipment providers to develop a fixed rate payment based on the preferred term selected of the school district (standard is 3-5 years). Crestmark Equipment Finance also serves as an independent, vendor neutral equipment financing company, which means we do not have specific manufacturer ties which allow Crestmark Equipment Finance to lease multiple types of equipment into one lease agreement. For example, we could provide financing for Cisco servers with IBM laptops and Apple iPads, security and access control systems, energy-efficient generators, and even office furniture all bundled into one lease agreement. At lease end, Crestmark Equipment Finance will work with the school district to offer many lease purchase buyout options: purchase the equipment; renew the lease for a specified time frame; or remove and install new equipment. The school district selects the option that best fits their equipment needs, their teachers and their students. With school districts winding down over the next few months, Crestmark Equipment Finance can work with municipalities now to line them up for the upcoming school year to get the proper equipment installed during the summer months and ensure everything is operational and ready for September. For more information about our diverse equipment leasing programs for Michigan school districts (or nationwide), please contact Crestmark Equipment Finance or call 888.999.8050. The borrowing for U.S. small businesses increased near the end of 2013, which has analysts optimistic about the economic outlook for 2014. This increase, reported by the Thomson Reuters/PayNet Small Business Lending Index, measures the volume of finance lent to small companies. At 120.4 in October and 111.4 in November, this level is the highest since August 2007—right before the financial crisis set in. Additionally, November, which only had 20 working days, saw the highest per-day borrowing rate out of the entire year. This kind of increase points to an optimistic U.S. economy. Normally, a high level of small business borrowing is correlated with overall economic growth because small companies produce more goods and increase assets, ultimately resulting in more money infused into the economy as well as the creation of more jobs. With lighter financial burdens, small businesses have been able to not only borrow more, but also pay back those loans in a timely manner. The percent of small business loans unpaid at 31 days past due and 180 days past due was down to 1.43 percent, which according to Reuters, is a new record low. For a little perspective, the number of delinquent loans reached a high of 4.73 percent in August 2009 and has steadily declined since then. Because PayNet’s lending index has typically correlated in the past to more overall economic growth for the next one to two quarters, analysts believe the US economy should continue to improve in 2014. Some factors in improving the outlook will be actual financial infusion—such as more business production—but the attitude of the American consumer will also play a key role. Getting a small business loan can be a challenging task when presenting a valid case for lending. So what information and paperwork are you going to need when applying to a lender in hopes that they will not only set you up with a loan, but will also get you a favorable one? Current within 90 days of your application. Projected income and finances for the next year with an explanation of how you will attain that goal. Bring a brief statement highlighting the history of your business and its successes and/or challenges. Explain in this why you need a loan to continue its success. Keep in mind that while this is a list of commonly-required documents, it’s important to check with each lender before meeting with them. Also, documentation is a good start, but it’s really only half of it. You’ll also need to be prepared to sell your business and yourself as its leader. Prove that you’ll be a valuable and trustworthy investment by showing a plan to pay back the loan, strong credit statements showing you have creditworthiness and several reasons why you believe your business has a solid chance at success with this funding. Are you in the process of looking for a lender? We want to help, and have professionals ready to discuss your business capital needs.